LEGO Learning! Games and Ideas for Learning with LEGO. We have come up with a big variety of LEGO learning ideas and will continue to add more over time. I am a huge fan of hands-on learning and we really, really enjoy LEGO. Adding those two things together provides a wonderful way for boys to learn. If you want your boys to learn more math, English, history or any other topic for that matter, make sure he is learning in a way that works best for him. Honestly, including LEGO will be the best thing you ever did. Just by playing around with LEGO the learning expands and because they are using their hands and enjoy building with bricks, the learning sticks. Incorporating a few games or open-ended play into the mix can be a great idea if they are open to it. 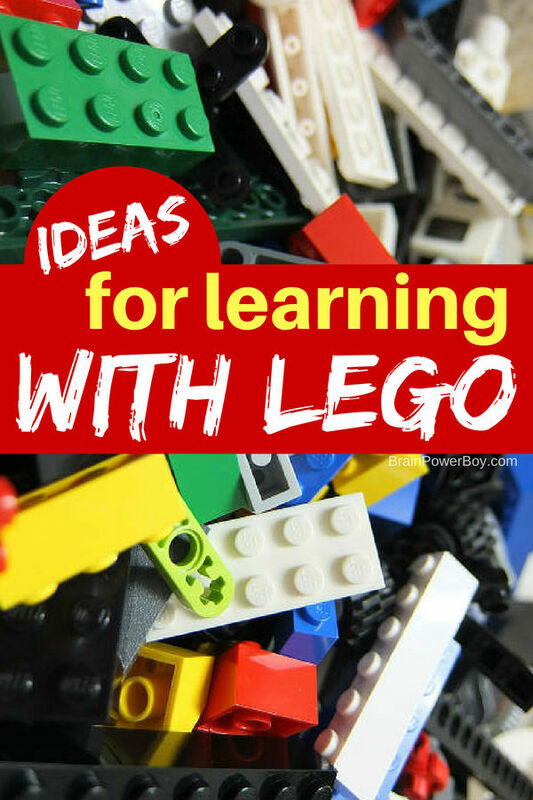 Try a few of these LEGO learning ideas on for size. To get started, you can read LEGO: What They Learn When They Play so you will have a solid understanding of just how much they can actually learn while playing with LEGO bricks. It is Amazing! Next up we have a series of LEGO math games. These games are all played with bricks and help kids to learn math. Surprising, but true! LEGO Math Games and the second edition, LEGO Math Games 2 are both packed with fun games that help them learn about math. If you have a child who is interested in science you can try Awesome LEGO Science Projects. This post is super popular so make sure you don’t miss it! Does your boy struggle with managing his time, or transitioning to the next thing without a struggle? If so, LEGO Time Management may be the answer. It uses a clever way of tracking time that works because it is visual and they actually like doing it. Ever want to get in a bit of history and geography but don’t want to make it all dull and boring like it was when we were in school? Learn Landmarks with LEGO to the rescue! Learn all about the world through tiny bricks. So cool! Do you need an activity for younger kids? Try these ideas: Play and Learn with LEGO and Playdough which include letter and shape stamping, making sculptures, a puzzle idea and more. This project is a doozy and really awesome for older kids. See the video in Make an Omnidirectional LEGO Robot to give it a try. If that wasn’t enough for you, I will be adding more to this list as we create more content. You can also try our LEGO Designs page for directions for making LEGO Builds and . . . a huge page that has all things Brick for more fun ideas. You may have to play around with different ideas to find some that work well for your boy, but give it a go because it is totally worth the effort.